For additional information please contact: isaac@ntu.edu.sg. 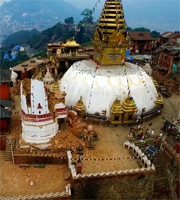 Produced by the Earth Observatory of Singapore in association with the Nepal Department of Mines and Geology. A Singapore/Nepal Co-Production. The Earth Observatory of Singapore (EOS) conducts fundamental research on earthquakes, volcanoes, tsunamis and climate change in and around Southeast Asia, towards safer and more sustainable societies.